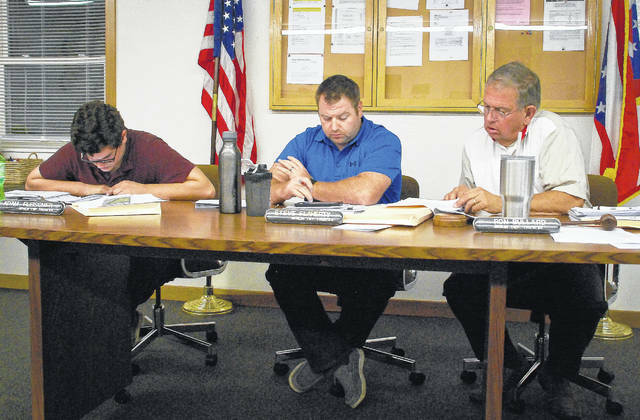 Berlin Township trustees, from left, Adam Fleisher, Steve Flaherty, and Ron Bullard look over a letter of opposition that was hand delievered to them by a resident Monday evening during the rezoning hearing. Berlin Township residents opposed to the development of a concrete production facility were disappointed with the outcome of the trustees’ meeting on Monday. Trustees approved the rezoning of 24 acres of land from Farm Residential to Planned Industrial Development, granting a request by Savko Brothers Properties X LLC, which plans to develop land located along U.S. 36 and State Route 37. The proposed Savko Commerce Park includes plans for construction of a concrete batching facility. Township residents in opposition to the rezoning measure left early when the measure was passed. Wright said residents are left with only one option: a referendum. After trustees approved the measure, Savko Brothers owner Marty Savko said nothing can happen until the company takes possession of the land in 30 days. His first concern is to clean up the old salvage yard as he promised to do during a previous meeting with the township and its residents. Savko told trustees that his plant will be outfitted with the latest technology. Savko said he is currently working to install the new system at his other plants. During the meeting, trustees asked that language in the proposal be changed to include that Savko Brothers is to seek all EPA permits as well as all other required permits by federal, state, and local governments. During zoning commission meetings, there were reports of residents in opposition to the rezoning packing the township hall. Many of the same residents attended the trustees hearing, packing the hall once again. “Property owners have the right to develop their land as they see fit,” said Trustee Steve Flaherty. Asked to weigh in on the rezoning by the trustees, Mark Fowler from the Delaware County Prosecutor’s Office civil division, said the first thing to look at is if the proposed use met the township’s zoning resolution. Fowler was asked if the threat of litigation existed with a referendum by one of the residents. Quinn said his property borders the property of the proposed industrial park. He explained his problem isn’t living next to a cement plant, but the traffic it creates at the intersection of Lackey Old State Road and U.S. 36/SR37. The suggested pattern by the Ohio Department of Transportation is for traffic to make a right turn from Lackey Old State Road onto U.S. 36/SR 37 and then a U-turn to make a left turn onto U.S. 36/SR37. Trustee Ron Bullard said the traffic pattern was a compromise at best and it wasn’t really a good one, but it was what ODOT is suggesting at this point. Bullard said there were only three things in the purview of the board that could lead to rejecting the rezoning. Quinn was asked if the residents would file a referendum to over turn the trustees approval. He said the group would need to meet before he could answer the question.